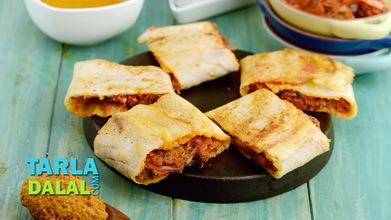 Crispy paper dosa is a super-star whose fame has carried it from South India to the most famous restaurants all over the world! 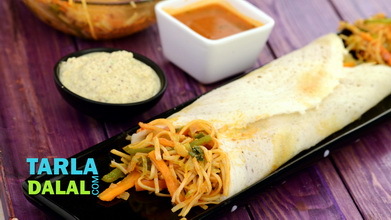 as the name suggests, this dosa is golden brown, crispy and so thin that a huge dosa can be made with just a ladle or two of batter. 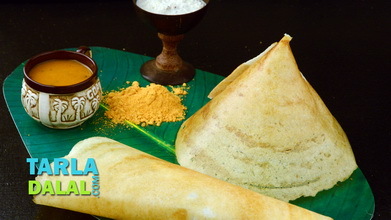 In hotels, it is generally folded up into a cone or roll before serving, making it a hot favourite amongst kids. 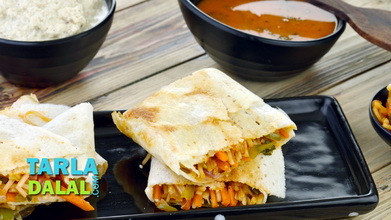 Serve hot with chutney and sambhar for a delicious South Indian meal. Wash and soak the raw rice and urad dal separately in enough water in deep bowls for 3 to 4 hours and drain well. 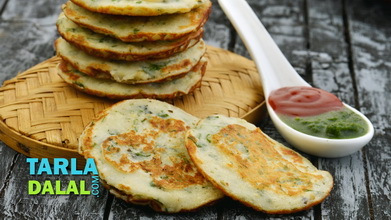 Combine the rice, urad dal and rice flour and blend in a mixer to a smooth paste using approx. 1 ½ cups of water to get a batter of thick pouring consistency. 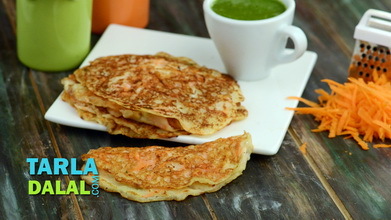 Heat a non-stick tava (griddle) and grease it lightly using ghee. 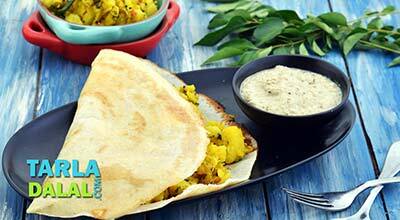 Sprinkle a little water on the tava (griddle) and wipe it off gently using a muslin cloth. Pour a ladleful of the batter on it and spread it in a circular motion to make a 225 mm. (9”) diameter thin circle. 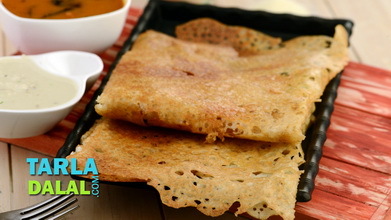 Smear a little ghee over it and along the edges and cook on a medium flame till the dosa turns golden brown in colour and crisp. Fold over to make a semi-circle or a roll. 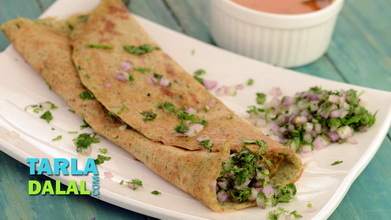 Repeat with the remaining batter to make 9 more dosas. Serve immediately with sambhar and coconut chutney.